TLJ News: June 1-5, 2013. 6/5. President Obama named Susan Rice to be his National Security Advisor. She is currently U.S. Ambassador to the United Nations. Sen. Ted Cruz (R-TX) stated in a release that "The nomination of Samantha Power is deeply troubling. No nation has spilled more blood or sacrificed more for the freedom of others than ours, and yet Ms. Power has publicly embraced the need for America to continue apologizing to the world for perceived transgressions". 6/5. President Obama announced his intent to nominate Howard Husock to be a member of the Board of Directors of the Corporation for Public Broadcasting. See, White House news office release. 6/5. President Obama announced his intent to nominate Steve Bennett (P/CEO of Symantec) and Angel Ruiz (Ericsson) to be members of the President’s National Security Telecommunications Advisory Committee. See, White House news office release. 6/5. President Obama announced his intent to nominate Robert Wolf to be a member of the President’s Export Council. See, White House news office release. 6/5. The Privacy and Civil Liberties Oversight Board (PCLOB) published a notice in the Federal Register (FR) that announces, describes, recites, and sets the effective date (June 5, 2013) for, its organizational and operational rules. See, FR, Vol. 78, No. 108, June 5, 2013, at Pages 33689-33690. 6/5. The Pew Research Center released a report titled "Smartphone Ownership -- 2013 Update". It finds that "55% of cell phone owners say that their phone is a smartphone" and that "58% of cell phone owners say that their phone operates on a smartphone platform common to the U.S. market." (Footnote omitted.) It continues that "Taken together, 61% of cell owners said yes to at least one of these questions and are classified as smartphone owners. Because 91% of the adult population now owns some kind of cell phone, that means that 56% of all American adults are now smartphone adopters. One third (35%) have some other kind of cell phone that is not a smartphone, and the remaining 9% of Americans do not own a cell phone at all." 6/5. The U.S. Patent and Trademark Office (USPTO) announced in a release that the USPTO and the Korean Intellectual Property Office (KIPO) a pilot program under which KIPO will classify some of its patent documents using the Cooperative Patent Classification (CPC) system. The USPTO and European Patent Office initiated the development of CPC system in 2010 to develop a common classification system for patent documents. 6/4. The Executive Office of the President (EOP) released a document that outlines the Obama administration's positions regarding patent reform, particularly abusive threats and litigation by patent assertion entities. This document includes a proposal that the Congress enact legislation that would "Permit more discretion in awarding fees to prevailing parties in patent cases, providing district courts with more discretion to award attorney’s fees under 35 USC 285 as a sanction for abusive court filings". It also proposes real party in interest reforms, changing in the USITC standard for issuance of injunctions, and creating an exemption from liability for patent infringement for off the shelf use by consumers and business. Rep. Bob Goodlatte (R-VA), Chairman of the House Judiciary Committee (HJC), and Sen. Patrick Leahy (D-VT), Chairman of the Senate Judiciary Committee (SJC) both welcomed these proposals. 6/4. The U.S. International Trade Commission (USITC) issued a Notice of the Commission's Final Determination Finding a Violation of Section 337 [4 pages in PDF] in its proceeding (Inv. No. 337-TA-794) on the complaint of Samsung against Apple regarding the importation of certain electronic devices alleged to infringe Samsung patents. Section 337, which is codified at 19 U.S.C. § 1337, among other things, makes unlawful the following: "The importation into the United States, the sale for importation, or the sale within the United States after importation by the owner, importer, or consignee, of articles that ... infringe a valid and enforceable United States patent or a valid and enforceable United States copyright ... or ... are made, produced, processed, or mined under, or by means of, a process covered by the claims of a valid and enforceable United States patent". The USITC found Apple in violation of Section 337 as to some but not all of the patents cited in the complaint. The USITC also issued a limited exclusion order that prohibits Apple from importing certain wireless communication devices, portable music and data processing devices, and tablet computers (certain older AT&T models -- iPhone 4, iPhone 3GS, iPad 3G, and iPad2 3G). It also issued a cease and desist order prohibiting sale and distribution in the U.S.
6/4. Federal Communications Commission (FCC) Chairman Mignon Clyburn announced personnel changes. On May 30, Clyburn named Michelle Ellison, who was Chief of the FCC's Enforcement Bureau (EB) to be her Chief of Staff. See, FCC release. Then, on June 4, Clyburn named Robert Ratcliffe to be acting Chief of the FCC's EB, replacing Ellison. See, FCC release. Ellison has worked at the FCC since 1995. Ratcliffe was Deputy Chief of the FCC's Media Bureau. Clyburn named Dave Grimaldi (at right) to be her Chief Counsel and Senior Legal Advisor. He previously worked as Chief of Staff to Clyburn. Before that, he worked on Capitol Hill, as Senior Counsel to Clyburn's father, Rep. James Clyburn (D-SC), and for former Rep. Ed Towns (D-NY), a senior member of the House Commerce Committee (HCC). Clyburn named Louis Peraertz (at left) to be her Legal Advisor for wireless, international, and public safety issues. He has worked for Clyburn since 2009. Before that, he worked in the FCC's Wireless Telecommunications Bureau (WTB) and Office of General Counsel. And before joining the FCC, he worked in the Department of Justice's (DOJ) Civil Rights Division. Clyburn named Rebekah Goodheart to be her Legal Advisor for wireline issues. 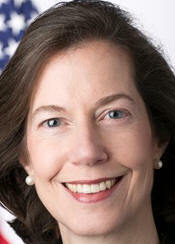 She has worked at the FCC since 2008, as Deputy Director of the Technology Transitions Policy, Associate Chief of the Wireline Competition Bureau (WCB), Senior Policy Advisor for the Omnibus Broadband Initiative, and Assistant Division Chief in the Media Bureau's (MB) Industry Analysis Division. Before joining the FCC, she worked in the DOJ's Antitrust Division's Telecommunications and Media Enforcement Section. And before that, she worked for the Washington DC law firm of Wiley Rein. Clyburn named Sarah Whitesell to be her Legal Advisor for media issues. She is a long time FCC employee. She was previously Deputy Bureau Chief of the FCC's MB. Before joining the MB in 2005, she held numerous other positions around the FCC, including in the FCC's Office of Strategic Planning and Policy Analysis, in the formerly named Cable Bureau, as acting Legal Advisor to former Commissioner Jonathan Adelstein on media issues, and as Legal Advisor to former Commissioner Gloria Tristani for common carrier issues. She has also worked at the DOJ's Antitrust Division, and for the law firm now known as Wilmer Hale (Wilmer Cutler & Pickering). Clyburn named Drema Johnson to be her Confidential Assistant, DeeAnn Smith to be her Staff Assistant, Dorothy Terry to be her Special Assistant, and Carol Lott to be her Special Assistant. 6/4. President Obama nominated Patricia Ann Millett, Cornelia Pillard, and Robert Wilkins to be Judges of the U.S. Court of Appeals (DCCir). See, White House news office release. He also gave a speech in which he asserted that this is not "court packing". He argued that "We're not adding seats here. We're trying to fill seats that are already existing." He added, "I didn't create these seats. I didn't just wake up one day and say, let's add three seats to the District Court of Appeals." The DC Circuit by statute has 11 seats for active status judges. See, 28 U.S.C. § 44(a). With the confirmation of Sri Srinivasan last month, the DC Circuit now has 8 judges. Four of the current active status judges were appointed by Republicans: Janice Brown, Brett Kavanaugh, Karen Henderson and Thomas Griffith. Four were appointed by Democrats: Merrick Garland, Judith Rogers, David Tatel, and Sri Srinivasan. At issue is whether this circuit needs any more judges, given its workload, and whether the President now seeks to pack the court with judges who are inclined to uphold broad assertions of executive authority. One consequence of three more Democratic judges would be that most three judge panels would have a majority of Democrats. A consequence of just one more Democratic judge would be that en banc reviews of opinions of three judge panels that go against the President, which require a majority vote from the active status judges, would be more likely. Court Packing Hypothesis. Of the three persons nominated on June 4, two (Millett and Pillard) have records as government lawyers who have often defended executive action in the courts. Their nominations are consistent with the hypothesis that the President is seeking to pack the court with judges more favorably disposed to the actions that he is likely to take in his second administration. President Obama showed only limited interest in the DC Circuit in his first term. Moreover, he squandered two and a half years half heartedly pushing a nominee (Caitlin Halligan) whom he could foresee from the outset would incite conservative opposition, and for whom red state Democratic Senators would be loath to vote. When President Obama came to office, there were solid Democratic majorities in the House and Senate. President Obama could implement many of his policy objectives through legislation, and Senate confirmation of his executive branch nominees. This limited the chances that any particular action would be overturned by the courts. Then, Republicans won control of the House in 2010, and Democrats failed to retake the House in 2012. Senate Democrats were left with a narrower majority in the Senate after the 2010 elections, and markedly less enthusiasm for pushing many of the President's initiatives. One Presidential reaction has been to implement policy objectives by executive action, rather than legislation. This in turn, resulted in greater scrutiny of executive nomimees. And this, in turn, resulted in the President making appointments -- purportedly recess appointments -- which the DC Circuit rejected in its January 25 opinion [PDF] in Canning v. NLRB. Hence, as the court packing hypothesis goes, President Obama, is concerned that the DC Circuit will strike down more unilateral executive actions, and thereby frustrate his pursuit of his policy objectives. Thus, to attain his policy objectives, his strategy is now to put more judges on the one circuit that hears many of the challenges to executive actions. President Obama is probably motivated most by concerns that the DC Circuit, without more Democrats, would strike down actions by the Environmental Protection Agency (EPA) and financial regulatory agencies acting under the rubric of Dodd Frank authority. However, the success or failure of his current effort would also affect technology related areas of law. For example, the President has failed to win passage of his favored cyber security regulation bill in either the House or Senate, and is now acting without legislative authority through an executive order and agency actions. He may take action that would be overturned by the DC Circuit with its current composition. Similarly, the Federal Trade Commission (FTC) may seek to create new or expanded regulatory regimes under the rubric of Section 5 of the FTC Act, for example, by ditching existing antitrust statutes and precedent, and instead regulate competition in the tech sectors under Section 5 in a more interventionist manner than the antitrust statutes now permit. A reconstituted court would likely be more amenable to such action. Backgrounds of the Three Nominees. Millett works in the Washington DC office of the law firm of Akin Gump. From 1996 through 2007 she worked in the Department of Justice's (DOJ) Office of the Solicitor General (OSG). Before that, she worked as a litigator in the DOJ's Civil Division. None of these three nominees could be described as experts in technology related areas of law. Very few judicial nominees are. However, it might be recalled that Millett argued for the government in KP Permanent Make-Up v. Lasting Impressions, Sup. Ct. No. 03-409, a case regarding fair use and trademarks. See, DOJ/OSG amicus brief, December 8, 2004 opinion of the Supreme Court, reported at 543 U.S. 111, and story titled "Supreme Court Rules on Fair Use in Trademark Case" in TLJ Daily E-Mail Alert No. 1,034, December 9, 2004. The Supreme Court held that "a plaintiff claiming infringement of an incontestable mark must show likelihood of consumer confusion as part of the prima facie case, 15 U. S. C. §1115(b), while the defendant has no independent burden to negate the likelihood of any confusion in raising the affirmative defense that a term is used descriptively, not as a mark, fairly, and in good faith". Pillard is a professor at Georgetown University law school. During the Clinton administration she worked in the DOJ's OSG and Office of Legal Counsel (OLC). She also possesses a record that would lead many conservatives to oppose her nomination absent any allegations of court packing. Wilkins is a Judge of the U.S. District Court (DC). President Obama appointed him in 2010. From 2002 through 2010 he was a partner in the law firm of Venable. Before that, he worked for twelve years in the Public Defender Service for the District of Columbia. More Information. See, related TLJ stories: "Sen. Grassley Condemns Obama's Plans to Pack DC Circuit" in TLJ Daily E-Mail Alert No. 2,569, May 3, 2013, "Obama Wants to Appoint Three More Judges to DC Circuit" in TLJ Daily E-Mail Alert No. 2,566, May 23, 2013, and "Future Nominees for the DC Circuit May Face Republican Opposition" in TLJ Daily E-Mail Alert No. 2,562, May 15, 2013. The American Constitution Society for Law and Policy issued a release backing the President. 6/4. Sen. Charles Grassley (R-IA) commented on President Obama's nomination of Mike Froman to be the U.S. Trade Representative. President Obama, who knows Froman from their law school student days, nominated Froman a month ago. See, story titled "President Obama Picks Mike Froman to be USTR" in TLJ Daily E-Mail Alert No. 2,557, May 6, 2013. He works in the Executive Office of the President (EOP) as Deputy National Security Advisor for International Economic Affairs. Before joining the Obama administration he worked at Citgroup. He also worked in the Department of the Treasury during the Clinton administration. Miriam Sapiro (at right) has been the acting USTR since May 23, 2013. The Senate Finance Committee (SFC), of which Sen. Grassley is a senior member, has jurisdiction over trade issues, and the nomination of the USTR. The financial disclosure form that Froman submitted to the SFC discloses Ugland House investment holdings. Ugland House is a building in the Cayman Islands that serves as the official address of thousands of corporations. President Obama gave a speech on May 4, 2009 regarding international tax policy and offshore tax havens. He focused on Ugland House. He said that "I used to talk about the outrage of a building in the Cayman Islands that had over 12,000 business -- businesses claim this building as their headquarters. And I've said before, either this is the largest building in the world or the largest tax scam in the world." He said that while most Americans meet their responsibilities to pay their fair share of taxes, "there are others who are shirking theirs. And many are aided and abetted by a broken tax system, written by well-connected lobbyists on behalf of well-heeled interests and individuals. It's a tax code full of corporate loopholes that makes it perfectly legal for companies to avoid paying their fair share. It's a tax code that makes it all too easy for a number -- a small number of individuals and companies to abuse overseas tax havens to avoid paying any taxes at all." The President said then that "It's the kind of tax scam that we need to end. That's why we are closing one of our biggest tax loopholes." Sen. Grassley's point is that Froman is one of those well heeled tax shirkers against whom the President railed in his 2009 speech. Sen. Grassley wrote in a memorandum to reporters and editors titled "Nominee with offshore accounts" that "President Obama called the Ugland House `the biggest tax scam in the world.´ Yet he nominated two top advisers in a row who invested in the Ugland House." Sen. Grassley continued that "When he was first elected, the President said tax avoidance through international tax havens forced ordinary Americans to `pick up the slack.´ He railed against fat cats who avoid taxes offshore. President Obama's hypocrisy is piling up with his picks for top posts in his Administration. If the latest nominations go through, he'll have two members of his Cabinet and one adviser with Cabinet-rank status who used the offshore practices he said forced ordinary Americans `to pick up the slack.´"
Jack Lew is the other Ugland House alumus picked for high office by Obama. Politicians have for a long time criticized tax laws regarding foreign income, and offshore tax havens. Moreover, most of the targets of these attacks are engaging in entirely lawful activity. However, the integrity and fairness of the U.S. tax system came under close public scrutiny with the disclosure in April of political targeting by the Internal Revenue Service (IRS). Jack Lew won Senate confirmation before the IRS scandal broke. In contrast, Froman faces a confirmation contest set against the backdrop of this unfolding IRS scandal. 6/4. The World Intellectual Property Organization (WIPO) announced a job opening in Geneva, Switzerland, for a program officer. The deadline to submit applications is July 2, 2013. 6/4. The Senate Commerce Committee's (SCC) Subcommittee on Communications, Technology, and the Internet held a hearing titled "The State of Wireless Communications". See, prepared testimony of Steve Largent (head of the CTIA), prepared testimony of Doug Webster (Cisco Systems), prepared testimony of Steven Berry (head of the Competitive Carriers Association), prepared testimony of Delara Derakhshani (Consumers Union), prepared testimony of Thomas Nagel (Comcast Corporation), and prepared testimony of George Ford (Phoenix Center). See also, SCC web page with hyperlink to archived webcast. 6/4. The Federal Communications Commission (FCC) published a notice in the Federal Register (FR) that sets comment deadlines for its Further Notice of Proposed Rulemaking and Notice of Inquiry (FNPRM & NOI) regarding human exposure to RF electromagnetic fields. The deadline to submit initial comments is September 3, 2013. The deadline to submit reply comments is November 1, 2013. The FCC adopted this item on March 27, 2013, and released it March 29, 2013. It is FCC 13-39 in ET Docket Nos. 03-137 and 13-84. See, FR, Vol. 78, No. 107, June 4, 2013, at Pages 33654-33687. See also, story titled "FCC Addresses Cellphone RF Exposure" in TLJ Daily E-Mail Alert No. 2,543, April 1, 2013. 6/4. The Federal Communications Commission's (FCC) Wireline Competition Bureau (WCB) released a Public Notice (DA 13-1305) that announces, and provides a URL for, illustrative model outputs from running the Connect America Cost Model version 3.1.2. 6/4. Neelie Kroes, Vice-President of the European Commission responsible for the Digital Agenda, gave a speech titled "The EU, safeguarding the open internet for all". 6/3. The Supreme Court issued its 5-4 opinion in Maryland v. King, holding that a Maryland state statute that allows police to take DNA swabs from persons arrested for (but not yet convicted of) certain enumerated felonies, without consent or court approval, does not violate the 4th Amendment. This opinion is pregnant with implications for legal regimes regarding biological and information technology based identification, investigation, databasing, and surveillance. 6/3. Sen. Charles Grassley (R-IA), the ranking Republican on the Senate Judiciary Committee (SJC), released a statement in which he criticized President Obama's plans to appoint three more judges to the U.S. Court of Appeals (DCCir). President Obama has not yet released the names of the persons he intends to nominate for the DC Circuit. With the confirmation of Sri Srinivasan by the Senate on May 23, the DC Circuit is up to eight active judges. The DC Circuit also possesses numerous senior status judges who play major roles. For example, the May 28 opinion [51 pages in PDF] in the Tennis Channel case, Comcast v. FCC, was written by one senior status judge (Stephen Williams), while another senior status judge (Harry Edwards) wrote a lengthy concurring opinion. However, pursuant to 28 U.S.C. § 44(a), there are eleven positions for active judges on the DC Circuit. Hence, nominally, there are three vacancies, which could be filled by President Obama. See also, stories titled "Obama Wants to Appoint Three More Judges to DC Circuit" in TLJ Daily E-Mail Alert No. 2,566, May 23, 2013, and "Future Nominees for the DC Circuit May Face Republican Opposition" in TLJ Daily E-Mail Alert No. 2,562, May 15, 2013. This President demonstrated little interest in enlarging the membership of the DC Circuit in his first term. That changed on January 25, 2013, when a three judge panel comprised of appointees of Republican Presidents issued its opinion [PDF] in Canning v. NLRB, the faux recess appointments case. Since Obama would likely pick persons who would be more deferential to the executive branch, one of the consequences of three more Obama appointees would likely be a Circuit more willing to uphold orders of the Federal Trade Commission (FTC), such as those that invoke Section 5 of the FTC Act to justify broad antitrust, patent, and privacy related actions, and actions of the Federal Communications Commission (FCC) that exceed statutory authority, or regulate free speech. Sen. Grassley stated on June 3 that "News reports have claimed over and over that the White House wants to put more of their own judges on the D.C. Circuit because President Obama is looking for ways to circumvent Congress. My Democratic colleagues have made their intentions clear when they said the President needed to fill the court by whatever means necessary and that the D.C. Circuit was `wreaking havoc´ on the country by opposing their policies." He continued that "Those who advocate for this type of court-packing to obtain an advantage in public policy debates, misunderstand the purpose of the legislative and judicial branches of our federal government. It's our job to make legislative decisions and the courts' job is to resolve cases and controversies. The last thing members of Congress should want is the courts doing our job." He concluded that "It's hard to imagine the rationale for nominating three judges at once for this court given the many vacant emergency seats across the country, unless your goal is to pack the court to advance a certain policy agenda. No matter how you slice it, the D.C. Circuit ranks last or almost last in nearly every category that measures workload. There were nearly 200 fewer appeals filed in the D.C. Circuit in 2012 than in 2005. In fact, the amount of cases that each active judge handles is nearly the same, despite having two fewer judges, in that same time frame. It's hard to imagine any reason for three more judges, no matter who nominates them." What Sen. Grassley did not disclose is that when a Democrat is President and making judicial appointments, Senate Democrats tend to support appointment of the full compliment of judges to the DC Circuit, while Senate Republicans tend to argue that the full number would be unnecessary. Conversely, when a Republican is President, Senate Republicans argue for more appointments, while Senate Democrats work to block those nominees. For example, Senate Democrats and Republicans have traded positions since 2006, when Republican President Bush sought to place Peter Keisler on the DC Circuit. Senate Democrats stalled that nomination until the end of the Bush administration, when it lapsed. There was a confirmation hearing on August 1, 2006. Sen. Schumer (at right) said that Senate Republicans blocked nominees for the DC Circuit during the second term of former President Clinton's presidency, citing low circuit workload. "Since these emphatic objections were raised in 1997, the caseload for the DC Circuit is down even further. The caseload has not gone up, it has gone down. Here are some statistics on that from the Administrative Office of the U.S. Courts. As measured by written decisions per active judge, the workload has declined by 17 percent since 1997. As measured by number of appeals resolved on the merits per active judge, it has declined by 21 percent. As measured by total number of appeals filed, it has declined by 10 percent. As measured by the total number of appeals resolved, the caseload has declined by a whopping 37 percent. So, Mr. Chairman, given the strident statements from some of my colleagues and the undeniable data from the administrative office, I am surprised we are rushing so fast here." That is, Sen. Schumer and Sen. Grassley trade playbooks when the party of the President changes. 6/3. Sen. Frank Lautenberg (D-NJ) died. See, release issued by his Senate office. 6/3. Securities and Exchange Commission (SEC) Chairman Mary Jo White named Robert Rice to be her Chief Counsel. See, SEC release. He previously worked for Deutsche Bank AG. Before that, he worked in the New York City office of the law firm of McDermott Will & Emory. Before that, from 1991 through 2000, he was an Assistant U.S. Attorney in the Southern District of New York. 6/3. Trial commenced in the U.S. District Court (SDNY) in U.S. v. Apple. See, opening statement [81 pages in PDF] submitted by the Department of Justice's (DOJ) Antitrust Division. Apple is the only remaining defendant. All of the publisher defendants settled with the DOJ. See, "DOJ Sues Apple and Book Publishers Alleging E-Book Price Collusion", "Analysis of DOJ's Sherman Act Claim Against Apple and E-Book Publishers", and related stories in TLJ Daily E-Mail Alert No. 2,368, April 11, 2012. 6/3. The court martial commenced in U.S. v. Bradley Manning in the United States Army Military District of Washington, Ft. Meade, Maryland. This case is also known as the Wikileaks court martial. Go to News from May 26-31, 2013.